Ouran High School Host Club Wallpaper: "Who's there?" Minitokyo »	Ouran High School Host Club Wallpapers » Ouran High School Host Club Wallpaper: "Who's there?" 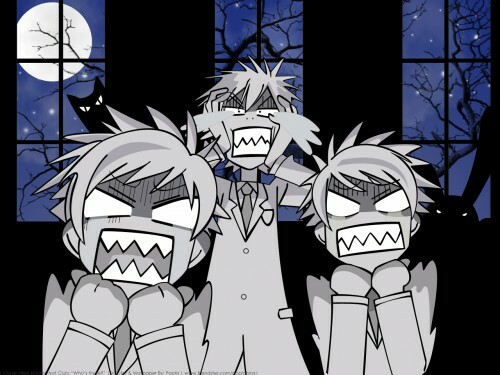 ~ One night, Tamaki and the Hitachiin twins snuck into the Haninozuka mansion to spy on Honey. The mansion was so large that, of course, they lost their way. Tamaki blamed on the twins for bringing along the wrong map. It was the twin's house map instead of Honey's. They ended up in one dark room, only litted by the moonlight through the windows. "Who's there?" a deep voice called out. "What are we going to do? I'm scared, Kaoru!" Hikaru screamed. This is an Ouran wallpaper made for the upcoming Halloween celebrations. The three characters, Tamaki, Hikaru and Kaoru were vectored using a screenshot from the episode when they accidentaly spilled tea onto Honey's Usa-chan. I was a bit lazy and busy so I dragged my feet during the whole vectoring process. I was a bit annoyed because the whole process was so tedious with lines lines and lines. but of course, for the sake of the "hate-no.-4", I had to make this the 5th. I'm a superstitious person and I don't like the number 4. The tree was a brush from ladyvictoire and the rest I did myself. I took the Usa-chan vector from my previous wall and vectored a brand new Nekosawa's cat puppet. I'm glad that I finished this wall early so that I could study with peace because of the "no.4" thing. Ahhh... Peace finally. I hope that this wallpaper would creep you all out! Hahaha! Funny wall! I love their expressions and the evil Usa-chan in the background! Lol...i remember here...al stun for a sec then RUN! The impressions are hilarious. LOVE IT! "ASTA EL DIA EN QUE SE CONVIERTA EN CALABAZA"
i remembered this scene. lol! well, i super love the twins.. specially Hikaru! LOL! Too funny. I love it! It's Bereznoff and BunBun! Run away! LOLLLL I loveed this in the anime. Thnx for making a wall! hahah they are so funny!I adore Tama -chan!